Lingual braces are a lot like regular braces, but they have brackets and wires on the inside of the teeth instead of the outside. Why choose this type of appliance? Because lingual braces offer some benefits other braces don’t. Lingual braces are almost invisible to the people around you. If you’re involved in a contact sport, they are much less likely to contact your lips and mouth. (But you should still wear a mouthguard!) If you play a reed or brass instrument, they won’t have as much impact on your lips, your mouth, and your performance. And, did we mention they’re almost invisible? Just like regular braces, lingual braces require careful cleaning to protect your teeth from staining, plaque and cavities. But because the brackets are located on the inside of the teeth, making sure your teeth are their cleanest can be a bit more challenging. Here are some suggestions for making your life with lingual braces a little easier. 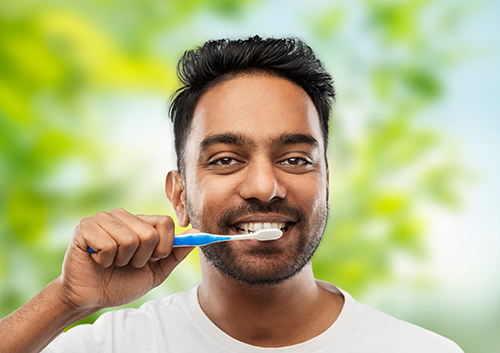 Because you will be working on the inside of your mouth, a brush with a smaller head might be more maneuverable (and more comfortable!) in a tighter space. If you use an electric toothbrush, look for a head attachment in a smaller size or one especially designed for orthodontic appliances. And for the tiniest spaces, use the tiniest brushes. Interdental brushes, also called interproximal brushes, can fit between your wires to clean around brackets as well as removing plaque between teeth. How to get that floss under the wire? Special tools called floss threaders can help get your dental floss where it needs to be. Or try one of the flosses meant for braces wearers, which offer pre-cut strands with a stiff tip at one end to thread between teeth and through wires more easily. For removing food particles and plaque between teeth, try interdental soft picks. These have a flexible, textured pick at the tip to fit gently into smaller, tighter spaces. They are also easy to carry on the go if you aren’t able to floss. Water flossers use a pulsing stream of water to clean between and around teeth. If you find it very difficult to floss around your lingual brackets, this might be a good option. Make sure any model you choose has a seal of approval, and has been tested for safety and effectiveness. Remember to keep up with your regular appointments at our Westfield, NJ office. It’s especially important to care for your mouth and teeth while you are wearing braces. No matter what type of appliance you use, get in the habit of cleaning your teeth and braces after every meal and snack. You will be rewarded with a beautiful and healthy smile when your orthodontic work is completed—and that’s the greatest benefit of all!